The setting rose to the occasion last evening during the finale of the ‘B’ and ‘C’ Division basketball championships. 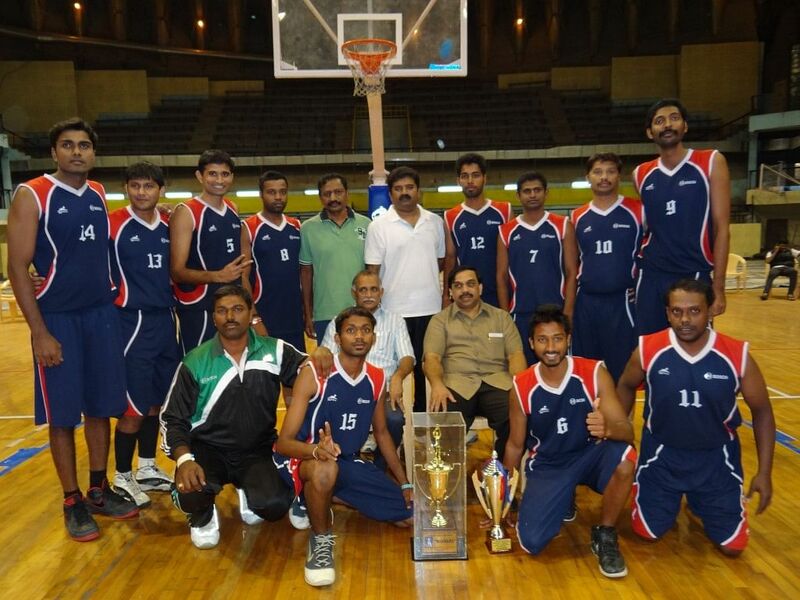 Over the last month, the Karnataka State Basketball Association had conducted all the league and semi-final matches of the ‘B’ and ‘C’ Divisions at the two outdoor cement courts of the Kanteerava Sports Complex, Bangalore. Through all these games, the adjacent indoor stadium remained a silent and empty spectator. The KSBBA authorities finally gave in to the precariousness of the weather, and fittingly chose to conduct the finals in the awe inspiring indoor basketball court. The Kanteerava indoor stadium may lack the facilities of the modern Thyagaraj Stadium of New Delhi — there are no plastic seats for spectators (just the iron skeletons in their place), the walls and ceilings could do with a fresh coating of paint, and the wooden floor has slightly aged to a deeper brown — but the Kanteerava stadium delights in its sheer presence. As soon as one enters, there is this sense of having walked into the sacred confines of a high roofed cathedral. The first match of the day was played between the ‘C’ Division finalists, Bosch and Orions SC. Despite the fact that this was the final game, with everything on the line, you couldn’t escape the feeling of eerie silence that pervaded the venue. Both teams consisted of aging players with full time jobs, and the stress of running up and down the court for four quarters was visible. In the end, Bosch proved superior, winning 52-46. 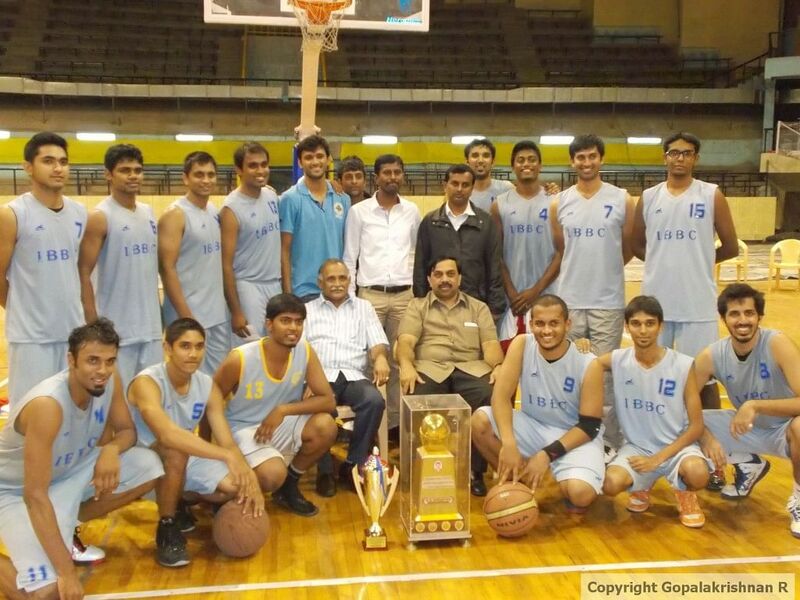 ‘B’ Division Champions, Indiranagar Basketball Club. In the marquee match of the evening, the two top teams of Division ‘B’, Sports Hostel, Bangalore and Indiranagar Basketball Club (IBBC) clashed for the M C Srinivasa Memorial Trophy. From the get go, IBBC controlled the tempo of the game, and never relinquished the lead through the entire 40 minutes. A recurring theme of this game was Sports Hostel drawing to within 3-4 points of their opponents and IBBC immediately going on a scoring run to re-establish a double digit lead. IBBC won 62-52 and remained an undefeated 7-0, in these championships. As the two best teams of ‘B’ Division, both IBBC and Sports Hostel, Bangalore have now been elevated to the elite ‘A’ Division for next year. On the other end of the spectrum, SAI Dharwad and KS Hegde, Mangalore have been relegated to the ‘C’ Division. They will be replaced in the coming season by current ‘C’ Division finalists Bosch and Orions SC. Karan Joshua, IBBC’s centre. This young, energetic lad is a junior India international and was also on the Senior Karnataka Men’s team on display at the Ramu Memorial Tournament, Mumbai. In these finals, he was unstoppable in the post through all four quarters. He rebounded effortlessly on both ends of the floor, en route to 25 match winning points. He also kept encouraging his teammates whenever they were sent to the free-throw line. SH’s shooting guard Vijay and centre Clinton. Vijay is a knockdown long range shooter. In the final, he also showed his willingness to drive to the basket whenever the lanes opened up for him. Undersized centre Clinton, played with a lot of heart against the bigger IBBC post players. The two of them kept SH within striking distance of IBBC for most of the game, despite poorer performances by some of their teammates. IBBC’s bench. IBBC played as many as 10 players in the finals, and all of them delivered in commendable fashion. IBBC’s players showcased a rare combination of discipline and physical aggression. Their perimeter players moved the ball patiently to both sides of the floor, and there was balanced scoring from outside and inside. As many as four IBBC players knocked down their three-point shots, and when the defence pressured them, they lobbed the ball in to Karan Joshua and Nityn Bulchandani in the post. IBBC’s players demonstrated the results that can be achieved when you put the team before the individual. Sports Hostel’s ploy to send IBBC’s players to the line in the dying minutes. In a strategy reminiscent of most NBAgames, SH kept sending the IBBC players to the free-throw line late in the fourth quarter to ensure they could get quicker possession of the ball and consequently more time on the offensive end. Unfortunately for SH, IBBC managed to convert their free-throws to maintain their lead. SH’s Turnovers. SH had nobody to blame but themselves for their multiple turnovers. They traveled, stepped out of bounds and misplaced passes to give the ball away too easily to IBBC. This though, is a young team that will keep growing in confidence with every high pressure match it plays. Sports Hostel’s decision to stick to a Zone Defense. SH played a zone defense for 3.5 quarters of the match. IBBC had no trouble in breaking the zone with their crisp passing between all five players. It is always easier to comment in hindsight, but who knows what difference it would have made if SH had switched to a man to man defense earlier, and not just in the last few minutes of Q4. SH’s Ganesh and Rangan. SH’s small forward Ganesh was a scoring machine coming into this final encounter, averaging around 20 ppg. He is a versatile scorer, able to knock down the outside shot, drive hard to the basket, push the ball in transition and complete tough And-1 plays. In the final however, he couldn’t connect on any of his outside shots (he, in fact, air balled a few). Also, with IBBC’s power forward/centre Nityn Bulchandani guarding him throughout, Ganesh was denied any easy scoring chances in the paint. SH’s wily point guard Rangan also had minimal impact in this game, after his playmaking and scoring brilliance in the semi-finals against Jayanagar Sports Club. Get outta here! IBBC centre Karan Joshua’s spin moves under the basket were electrifying to watch. It brought back faint memories of legendary NBA centres Hakeem Olajuwon’s Dream Shake and Shaquille O Neal’s Black Tornado. But Karan was on the receiving end in the standout play of the evening. An IBBC player passed the ball to Karan at the top of the key. Karan found himself free and exploded to the rim for a one handed slam dunk that would have brought the house down. Unfortunately, he was met high above by SH’s Clinton, who rejected the ball into the sidelines. ‘C’ Division for Sri. S Rangarajan memorial trophy: Bosch 52 (Avinash 12, Ashwin 10) bt Orions SC 46 (Suhas 27) HT 25-31. ‘B’ Division for Sri. M C Srinivasa memorial trophy: IBBC 62 (Karan 25, Shiva 11) bt Sports Hostel, Bangalore 52 (Vijay 16, Ganesh 13) HT 27-22.